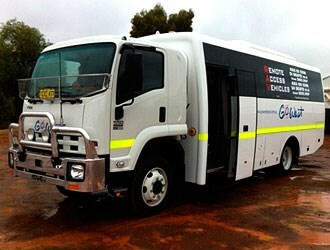 The 2012 Kalgoorlie Mining Expo held from October 29-31 was the main launching pad of the newly conceived RAV off-road truck-bus, supplied by Go West. RAV modules are available for 4X4 and 4X2 applications and can be built to suit all types of trucks including MAN, Hino, Isuzu, Mitsubishi, and Mercedes-Benz. The RAV - Remote Access Vehicle - was launched by BCI founder Ron Nazzari's son-in-law Josh McKenzie. McKenzie is working with some of the most experienced veterans of the industry and sees that these true truck-bus modules are going to stand-out for a few reasons. "From an engineering point of view, we have the most experienced people in the industry working with us," McKenzie says. The modules are ADR compliant and have ISO 9001 accreditation. "From an OH&S perspective, there really is no product on the market that meets the same levels in handling and safety," he says. "Particularly for the rough pothole laden dirt roads of mine sites, the four-wheel drive truck gives better handling and safety than a bus and that translates well for the mine sites concerned with occupational safety." The first RAVs landed in Australia last month and were purchased by Western Australia-based Go West. Go West will put the first RAV built on a 10-tonne FSS 550 Isuzu into a mining application. Go West owner Stan Haoust saw the value in the module not only for its price-point over its competitors, but because the body has been tried-and-tested on the mine sites he operates in. "All the features are there and the ride is excellent for a 4WD," Haoust says. The modules vary in capacity from 15 to 49 passenger seats and like a luxury coach, can be customised with many options including walk-in storage, on board toilet, fresh water tanks, mine specification upgrades, on board entertainment such as LCD screen, DVD and a range of other features. "Other people make a truck with a pod on the chassis," McKenzie says. "This is a real bus with all the creature comforts the customer wants to adapt to it - at a great price." While McKenzie believes the biggest market will come from the mining industry, the RAV modules will also appeal to truck-enthusiast country school bus operators, based on accessibility and ease of maintenance because of the standardized chassis. Find BCI buses for sale. Search for new BCI specs.